Can you see what is going on there? 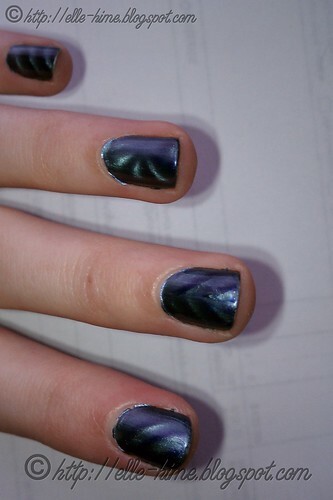 Depending on the angle you see your nails from it looks like the design in your nails is moving!! Yes, amazing! Sure my first attempt at doing this is full of mistakes but it does not take away from the fact that it is a totally awesome effect. More thoughts after the jump! Ferromagnetic Blue is a really neat color - it appears deep blue in pictures but in sunlight it actually shows purple-blue. The color has extremely fine shimmer in it besides the metallic pigment. The metal particles look blue-grey and dark grey; they appear to be dual-toned depending on how you view. This nail polish is quite thick, and it can be hard for me to attain perfectly smooth application. I used a clear base coat (not needed according to LCN), and most of these nails are just one coat. 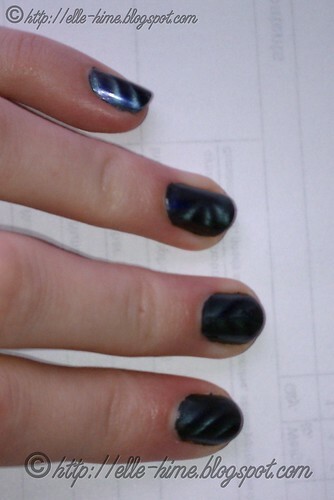 That is really pigmented nail polish! Also, it dries fast. Almost too fast because it makes it tricky to complete your design. You must paint quickly and immediately get the magnet over your nail. The upside was that my nails dried without the need of a fast-drying top coat - in fact I only did a top coat on my middle fingers to help smooth out the globby polish from doing a V design. The magnets are a little frustrating to work with because you have to hold them *really close* but not touching the surface of your nail. 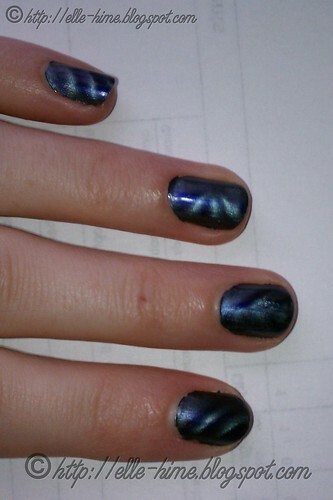 Also, my nails are quite domed from side to side so I feel like the edges aren't getting much magnetic design. Because this polish is so awesome to look at I definitely will keep practicing with it and hopefully get better in time. It's not fool-proof like shatter/crackle nail polish, but I can definitely see this crowding out some of the attention crackle coats are getting. Also, guys can appreciate the awesomeness of watching these nail polishes work. It hurts that it costs more and you don't get as much as you do with most "normal" nail polishes... But the good news is that you should not have to use very much at one time. The colors have very opaque coverage so a bottle should last a good while!